The majority of ERP solutions today are built off old technology. Slow, incapable, and dying. VersAccounts is here to change that. The VersAccounts system is built on the most modern platform available, and easily integrates with all modern systems. Our customer focused development process allows new users the support they need to further develop workflows, and cut down on time-wasting activities. No more copy and pasting! It also reduces the number of systems your company needs and is a true all-in-one, real-time solution. To compete in the post "Amazon Effect" market place, omni-channel business is a must. Rest assure whatever channel you choose, VersAccounts is compatible. Global view for our local and global branches. It is simply the only low cost replacement for SAP, once your company outgrows quickbooks or other similar software. Not everything should be fixed for all users but should be customized to meet ones needs. That's the best benefit l get from Versaccounts. The ability to have it configured to meet your specific business needs is the best feature of Versaccounts. While it meets the use of any US or Canadian company out of the box, when your business is expanding and you need to have a global out look, Versaccounts is your choice at the best possible price. While SAP can offer a global view, you will be paying hundreds of thousands of dollars for their solution compared to a few thousands for Versaccounts. We run a global company with branches in a few countries that have different accounting system and we quickly outgrew Quickbooks. We searched for an affordable solution and only Versaccounts was able to meet our needs at an affordable price, as well as configure it to meet our global needs. Our system was remodified to meet the needs of our global partners with the ability to automatically split invoices between various countries. The configuration was done at about 50% of what the closest rival quoted and was completed 1 month ahead of schedule. The Versaccounts team is also a wonderful team ready to help at any time you call on them. We have been using them for over 3 years now and so far have absolutely no regrets whatsoever. The ability to have it configured to meet your specific business needs is the best feature of Versaccounts. While it meets the use of any US or Canadian company out of the box, when your business is expanding and you need to have a global out look, Versaccounts is your choice at the best possible price. While SAP can offer a global view, you will be paying hundreds of thousands of dollars for their solution compared to a few thousands for Versaccounts. We run a global company with branches in a few countries that have different accounting system and we quickly outgrew Quickbooks. We searched for an affordable solution and only Versaccounts was able to meet our needs at an affordable price, as well as configure it to meet our global needs. Our system was remodified to meet the needs of our global partners with the ability to automatically split invoices between various countries. The configuration was done at about 50% of what the closest rival quoted and was completed 1 month ahead of schedule. The Versaccounts team is also a wonderful team ready to help at any time you call on them. We have been using them for over 3 years now and so far have absolutely no regrets whatsoever. I am not the biggest fan of any software that charges per user access. I believe a software package should provide a fixed cost and lets the company have any number of users as they desire. The charge per user limits us on the number of users we can have at a reasonable cost. Despite this, of over 20 top of the line softwares we looked at, Versaccounts still had the best price overall at the best value. Also, l will love if they can provide more detailed training videos that are accessible on youtube or their channels free of charge so its easier to on-board new users to the software. My business started small. One of the biggest difficulties I've had is understanding how important it is to get the right accounting software in place - first. I thought because I was small volume, I should pick simple, low cost solutions. I started with Quickbooks online, then went to desktop, then went to a full QB enterprise, and then added an inventory/CRM application to QBE. I did all of this over 5 years of a growing specialty inventory business. What a waste of time and effort! If I had access to Versaccounts at the start, the right choice would be to build it in at the beginning. I can't say how hard it is to move into an ERP while your in a growth phase. It's a major distraction while your trying to manage growth. The sad thing is that I was spending the same amount of cash on multiple QB files and add on AP's that I now spend on Versaccounts. A growing Canadian export market drove our business into doing business in two countries with two currencies. We had to house this activity into two legal entities and then a holding company. I could never have scaled this up on single entity based software. The big Oracle or Microsoft products were still too expensive. Finding Versaccount saved me from some serious obstacles. 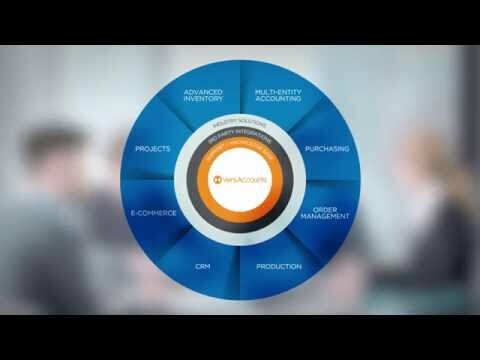 What I'm experiencing is a robust ERP that allows me to operate in multi everything from: inventory locations, currencies, entities, sales tax reporting, user levels. All of it cloud based with no server or IT issues. It's really amazing to me that I can run a quarterly income statement for 3 entities in two currencies and countries on my iPAD while traveling anywhere in the world with just my safari browser. The reports all rollup into one segment on one tab, and consolidated into my home currency. Getting current, accurate income and balance sheet information gives me the confidence and ability to guide a quickly growing business. The Versaccounts team worked with my team and helped me migrate an operating multi location, currency, and entity business into Versaccounts in a short 3 months in the middle of the business year. I can tell you - it's no small task and should not be attempted lightly. The fact that we made it through the migration is a testament to how seriously Versacounts is took our business. Now that we are through the change, I'm back to working on helping growing customers and forming new supplier relationships instead of spending my time fixing things on a underpowered accounting system. Versacounts has the capacity of the big ERP's at a price my business could afford. The value is really surprising. Our experience with the entire Versa team has been completely wonderful. They take the time to learn about our needs and the industry we are in. However, their wheels are always turning to see if another client has the same need and how they can help every customer with a new feature within the program. The team is personable and welcoming each meeting we have. I truly can't say "Thank You" enough to this team for everything they help us do. Cheers VersAccounts Team!The team at VersAccounts has really made our whole operations for inventory control, sales order processing and financial reporting seamless. The best feature about this platform is the support behind the platform. The support team is by far the best I have had the pleasure to work with. They provide custom modifications meet the needs of our industry and continue to impress us with what they can help us accomplish and provide more service to our customers. We recently integrated VersAccounts with our online dealer shopping platform. The team at VersAccounts made the integration for their part stress free and successful! The team at VersAccounts has really made our whole operations for inventory control, sales order processing and financial reporting seamless. The best feature about this platform is the support behind the platform. The support team is by far the best I have had the pleasure to work with. They provide custom modifications meet the needs of our industry and continue to impress us with what they can help us accomplish and provide more service to our customers. We recently integrated VersAccounts with our online dealer shopping platform. The team at VersAccounts made the integration for their part stress free and successful! The VersAccounts Cloud ERP system enables organizations to automate all operations from a single integrated ERP system across multiple companies, countries, and currencies. VersAccounts offers various pre-existing integrations with third party CRM, banking, payment services such as Shopify, iMongo, Avalara, SalesForce, and more. VersAccounts eliminates the need to file paper copies of purchase orders, invoices, and contracts by providing cloud storage for all important scanned and digital documents. VersAccounts offers a large number of standard business reports that can be personalized for each individual customer's needs. The platform supports the latest cloud and mobile technology that can be accessed from any desktop or mobile device, anytime, anywhere. Below are some frequently asked questions for VersAccounts. Q. What type of pricing plans does VersAccounts offer? Q. Who are the typical users of VersAccounts? Q. What languages does VersAccounts support? Q. Does VersAccounts support mobile devices? Q. Does VersAccounts offer an API? Yes, VersAccounts has an API available for use. Q. What other apps does VersAccounts integrate with? Q. What level of support does VersAccounts offer? Q. Which apps is VersAccounts compared to most often?